Keep a reminder of a memorable place on hand with these recycled sterling silver stacking rings. Don't just reminisce about your favorite place...carry it with you. Some rings are infused with obvious significance—wedding rings, class rings—but these stacking bands by Ana Talukder are the ultimate, personalized keepsakes of a favorite spot on the globe. 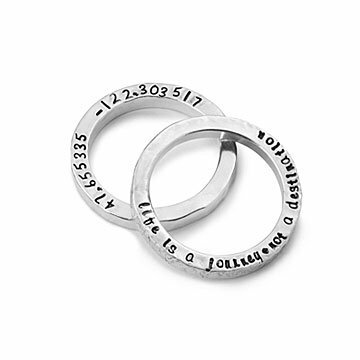 Pair a set of rings in two different finishes (textured and hammered), with your chosen latitude and longitude coordinates on the inside of one, and the fitting quote, "Life is a journey not a destination" inside the other. In a world constantly in motion, ground yourself with a geographic memory cast in solid sterling silver. Handmade in Seattle, Washington. Make it a set! Click here to see the matching Latitude Longitude Charm Bracelet and Latitude Longitude Charm Pendant. Ana Talukder loves texture, pattern, and all things geeky. She designs unique jewelry as well as sentimental wood pieces that allow you to commemorate something special. This might be a necklace that reminds you of a place you hold dear, or a cutting board with a loved one's recipe etched into it. With everything she creates, Ana uses traditional methods so that each piece is timeless. She lives and creates her beautiful works in Washington. Take a studio tour to see where Ana creates her charming jewelry designs! Worst rings ever! Pure trash! Don't buy!! Can't read a single thing on the edge...even with a magnifier! The outside edges of the rings look like they were poured from some kind of mold...and were not even finished. I rec'd the rings today...were suppposed to be a Father's Day gift...but these are so bad I wouldn't even put these on my dog's collar! So glad I have time to get something else. The ring set is exactly as described in the catalog and is gorgeous, my daughter loves it. Also wanted to say that it came in ahead of schedule, I am very pleased and likely to order again from Uncommon Goods. This was the perfect gift for our graduating high school senior. We put the lat and long of "home" to take with her as she moves into the world on her own.